Thanks, Megan, for this link! A rector has banned “Goths” from posing for photos in a graveyard after catching dozens lounging on tombs. Gothic rock fans flock to Whitby’s historic St Mary’s Church in North Yorkshire during Whitby Goth Weekend to be snapped by photographers in the graveyard. 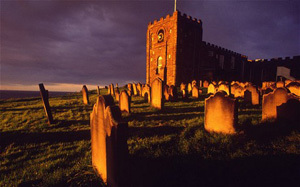 The cemetery is the place Dracula takes his victim Lucy Westernra during the night in Bram Stoker’s classic novel, overlooked by the imposing abbey.